Kids transforming horses while being transformed themselves. The Mustang Project is open to students 13 years of age and older. The program is for those students interested in learning more about horses but do not have the facilities, finances, or family support to own their own horse. We especially welcome "at risk" students - those who may be struggling in school, or socially, due to their home life, peer pressures, or academic challenges. While basic riding skills will be taught, this is not the focus of the program. We believe that true horsemanship is more than getting on a horse and riding. There is no charge to students to participate, however students are expected to participate on a regular basis, keep their school grades and attendance up, and maintain good conduct at home, school, and in the community. The Mustang Project advocates and participates in the adoption of Mustangs. These horses are gathered from both BLM and state controlled lands. Thousands of young healthy horses are available for adoption through the BLM and many have been in holding facilities for far too long. Mustangs gathered from state controlled lands are not protected, and can go directly to auction where they can be sold for slaughter. The Mustang Project's goal is to adopt and train as many of these Mustangs as possible, either for use in the program, or to be adopted by the public. All horses that are part of the Project are trained using recognized "non-forceful" gentling methods. Mustangs have been successfully trained for all types of work, competition, and enjoyment. To learn more about BLM Mustangs: BLM Wild Horse and Burro Program. The Mustang Project is looking for property in Northern California for a Mustang Sanctuary and Education Center. Besides being a place where mustangs can be gentled and trained, this will be a sanctuary for mustangs that should be left wild. We received 60 of what remains of the historic Sheldon Herd located in NW Nevada. To learn more about the Sheldon Horses and how you can help, click here. The sanctuary will be open to visitors wanting to learn about and see Mustangs in a natural setting. Information, clinics and public events will be offered about Mustangs, and to increase public awareness about adopting and gentling Mustangs and the plight of Mustangs on our public lands. In addition, our long range goals are to offer a program for veterans and a youth camp program, all using Mustangs that have been adopted or were in danger of going to slaughter. We are seeking donations that will be set aside specifically to purchase the sanctuary. To donate, please click on the Paypal button below, or go to our Donate page. 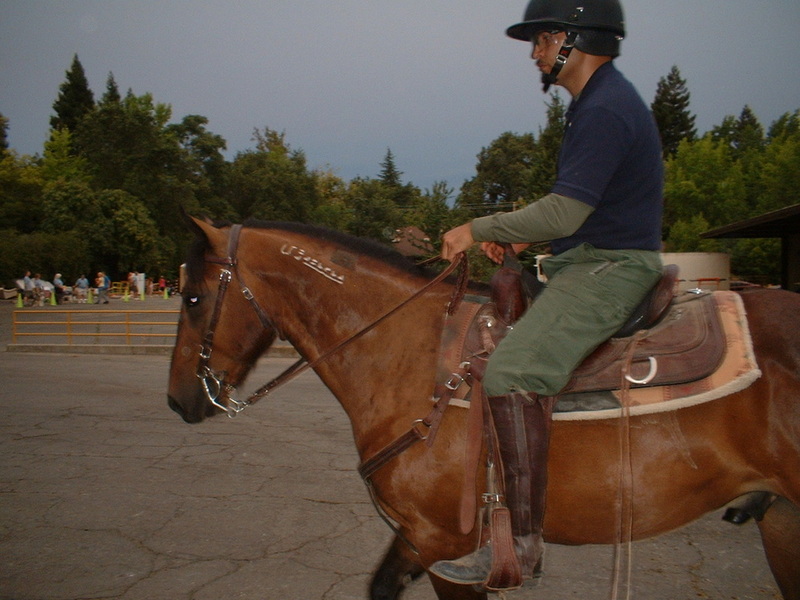 BLM horse used in border patrol at a mounted police training in Northern California (note: The Mustang Project endorses the use of bit-less bridles). To make a one-time donation using PayPal, click the Donate Button. To make a monthly donation using PayPal, select the amount, then click the Subscribe Button.